Mosaic is the art of creating patterns and images from small pieces of a certain material, the usual being colored glass or stone. With the advent of technology, the art of mosaic making (which started in Mesopotamia) took a turn for the bizarre. Here are 10 fascinating mosaic artworks made with equally unusual materials. The pupils at Eisenhower Junior High School in Taylorsville, Utah, must have been proud of their alma mater, for the school claims to ‘have set more world records than any other school!’ They currently hold nine world records and their record-breaking attempts have appeared in Guiness World Records and Ripley’s Believe It Or Not! One of the records the school broke is the World’s Largest Post-It Mosaic. 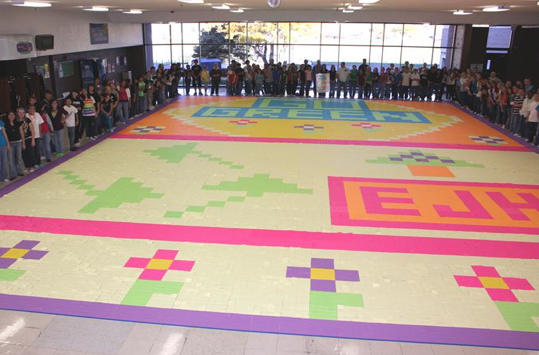 On November 6, 2009, 151 pupils participated in constructing a 60-feet by 40-feet mosaic using 38,400 colorful Post-It notes. The resulting mosaic illustrated the theme ‘Go Green.’ The Post-It notes were later recycled. David Alvarez, an 20-year old art student from Leavenworth, Washington, proved that you didn’t need to be good at drawing to be an artist after unveiling his 25-feet high portrait of Jimi Hendrix made from more than 8,500 Bicycle playing cards (or 168 decks). Using a Photoshop program, he first divided a picture of Jimi Hendrix into parts and map out where the colored playing cards should go. Then, on a single day, Alvarez worked 21 hours painstakingly placing each card on its right position, on a Styrofoam core board, with double-sided tape, only resting for an hour and half before working again. A video documentation of the project, made by Eric Splittgerber, can be seen here. Americans get swamped every year by millions of tons of junk mail. 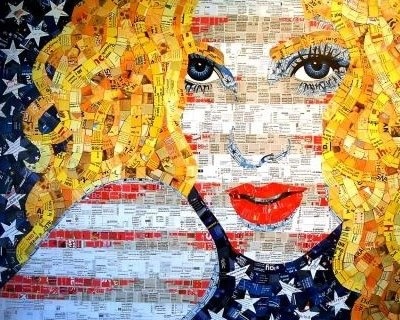 Sandy Schimmel, an Arizona artist, decided to put them into good use and creates beautiful, vivid mosaic pictures out of her junk mail in a process known as ‘upcycling.’ Inspired by a mosaic that she saw while in Venice, Schimmel’s artwork are mostly portraits, including a piece featuring Madonna called All American Blonde and a recreation of the famous painting Birth of Venus. To see more of her artwork go here. 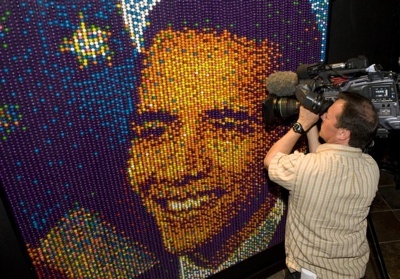 Franz Spohn, illustrator, sculptor and professor of art at Edinboro University in Pennsylvania, specializes in creating large mosaic murals depicting famous people like Barack Obama, Rosa Parks and Robert Ripley from hundreds of gumballs. To achieve this, Spohn fills plastic tubes with several gumballs, stacked according to color, and lines the tubes up to create his masterpieces. Pete Mason from Staffordshire, England, claims to be the ‘Post Pop Art’ man. 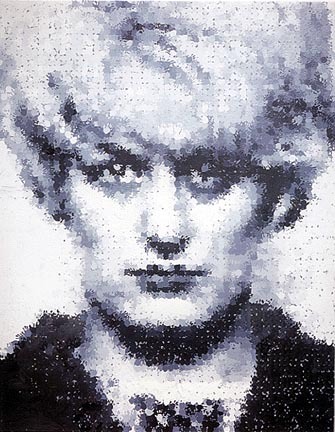 Combining Pop Art and graphic design, he creates portraits of famous icons like Martin Luther King, Jr. and Princess Diana out of recycled postage stamps. 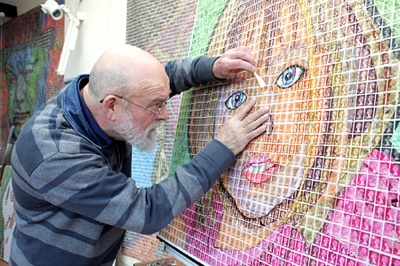 Typically, his larger works uses around 20,000 stamps. To make a portrait, Mason first draws the picture he will work on on a canvas. Then, he divides the picture in stamp-size squares. Then, the stamps, sorted out by color, design and postmark pattern, are applied to the surface. 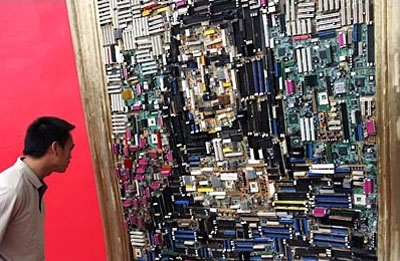 In an art exhibition in Beijing, China, in 2006, a group of computer engineers displayed a recreation of da Vinci’s Mona Lisa made out of computer parts. Made of various circuits and chip sockets, the work, entitled Technology Smiling, fascinated the visitors. Since 1988, Emma Karp and her father Helge Lundstrom have been creating huge apple mosaics for the annual Kivik Apple Festival. The Swedish town has long been an important fruit supplier in Sweden, and the festival celebrates the end of the harvesting season in Sweden, which is around late September. 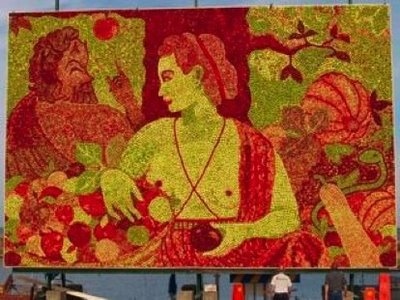 The centerpiece of the festival is the apple mosaic, which can contain up to 75,000 apples in different varieties, which is equivalent to 8,820 pounds. 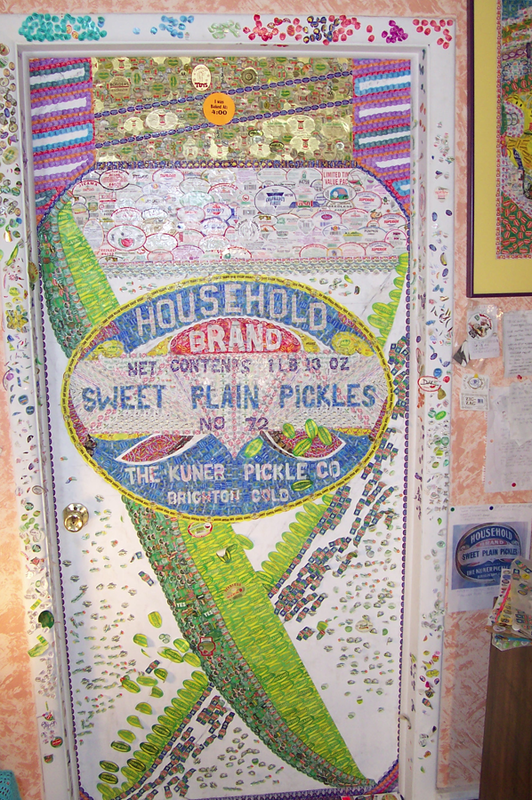 Barry Snyder of Erie, Colorado, creates amazing mosaic artworks out of those annoying stickers you see in store-brought fruit and vegetables. 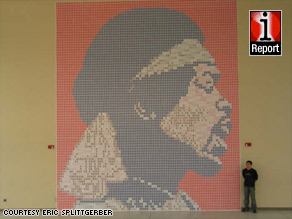 His 4-sq-ft creations are typically made out of around 4,000 stickers and take him around six months to create. Many of the stickers he uses are sent to him by people from around the globe. His original works are so popular that they can sell for up to $10,000. If you want to donate stickers, or to view Snyder’s works, go here. 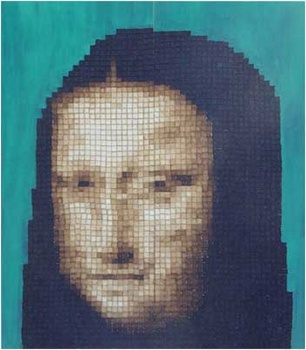 Scott Blake specializes in creating portraits of famous icons out of bar codes. His bar code art was inspired by the Y2K computer bug, where he created his first bar code mosaic of Jesus Christ using Photoshop. Since then, he has created around thirty portraits of famous icons such as Andy Warhol and Arnold Schwarzenegger. Scoot also created several interactive pieces where scanning the bar codes on the mosaic flashes up images of the person pictured in the mosaic on a screen . This was done on Scott’s portrait of Bruce Lee and Elvis Presley. For more information, visit here. 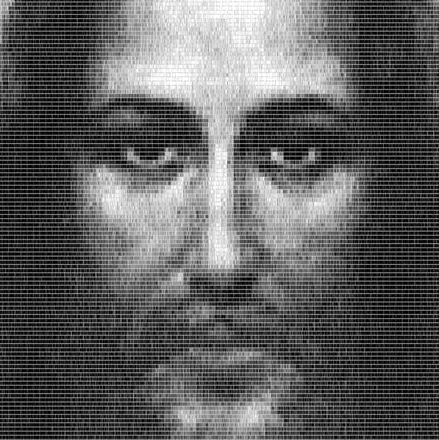 Maurice Bennett of New Zealand, tops the list for his mosaic portraits of famous people made from thousands of toasted bread, burned in varying degrees to create different shades. His works have depicted such greats as Jonah Lomu, John Key (NZ Prime Minister) and Peter Jackson. His works are typically displayed on billboards, where his works are best viewed. To learn more about Bennett, go here.